Huge and varied collection of eclectic weapons; amazing graphics and audio; RPG elements add depth; varied level design; hilarious writing; memorable characters. No multiplayer; camera sometimes gets in the way; controls aren't as tight as they could be; some annoying fetch quests; the search for compelling Sixaxis controls continues. 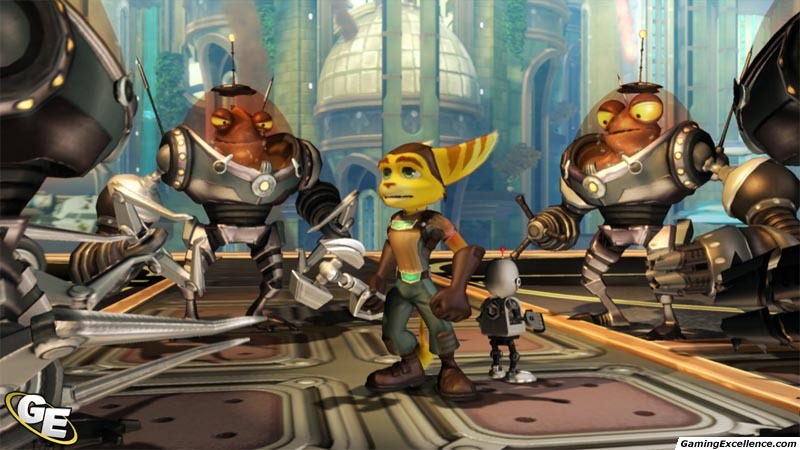 I'll be the first to admit, I've never been really into the Ratchet and Clank series on the PlayStation 2. For whatever reason, I found it difficult to get into a series that combined furry and cute creatures with weapons of mass destruction. The last title in the series that I played was Going Commando way back in the day. However, after playing the new installment on the PS3, I rather regret my past decisions to skip the franchise in the game isles. Thankfully, prior knowledge of the series is not necessary to enjoy this installment to its fullest. 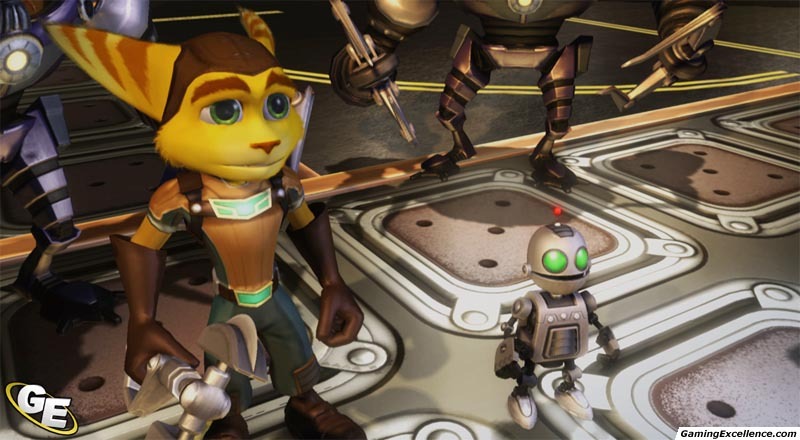 The story deals with Ratchet, the last of the Lombax kind, and his small robotic companion, Clank. 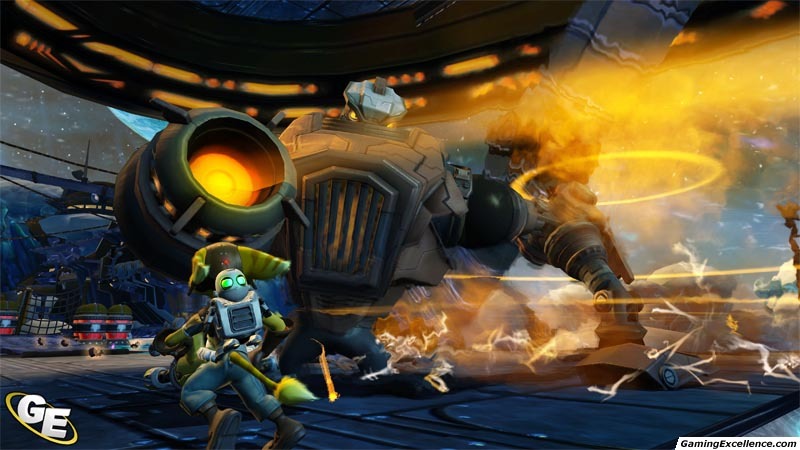 Ratchet is on the run from the psychotic Emperor Percival Tachyon, who is attempting to wipe every last Lombax from the face of the galaxy. While Ratchet is on the run, Tachyon is also looking for the "Lombax Secret", a secret weapon that could spell doom for the galaxy. 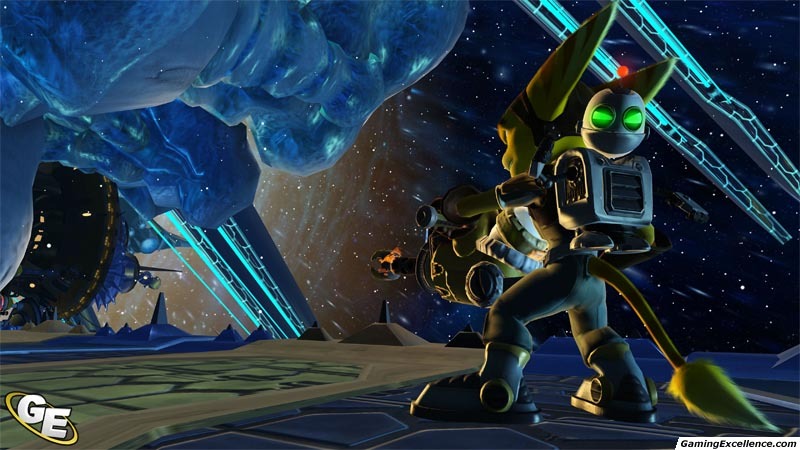 As Ratchet and Clank, it's up to you to survive long enough to stop Tachyon from getting his hands on the doomsday device. While the story itself may not be Shakespeare by any stretch, the game features some absolutely hilarious writing and extremely memorable characters. 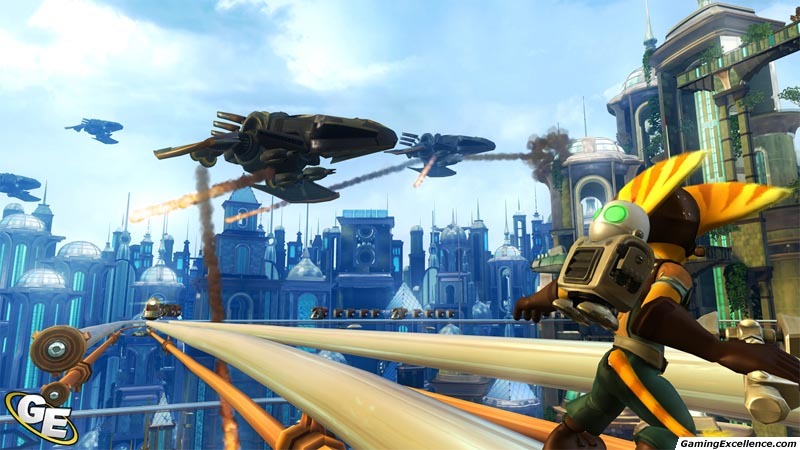 Ratchet and Clank have outstanding chemistry together and share some very funny dialogue. Tachyon himself has an amusing inferiority complex that the writers play upon quite a bit. You also have a talking ship that I like to call NightShip. You know, like NightRider, only a ship instead of a car. Ah forget it. The best character however, is Captain Quark, a "hero" who shares a lot more in common with Zap Brannigan from Futurama than a brave fighter. Add in some riotous gags during the cutscenes, and you've got a game that's guaranteed to make you laugh thoughout the entire length. My personal favourite gag involves a punch-in-the-face induced cryo-sleep. Sure, the game is comical, but how does it play? The answer is pretty well, but not perfectly. The bulk of the game involves shooting almost everything in sight, with a wide variety of awesome weapons the likes of which you have never seen before. My personal favourite is the Groovitron, a grenade that turns into a disco ball complete with lights and disco music. Once you use it, all your enemies will drop their weapons and start shaking their groove thangs. Other awesome weapons include the shotgun-esque Shard Reaper; the Magma Combuster which resembles the spread gun from Contra; The Predator, which is a lock on missile system; and a transmogrifier weapon that turns your enemies into penguins. For utter hilarity, use the transmogrifier followed by the groovitron. 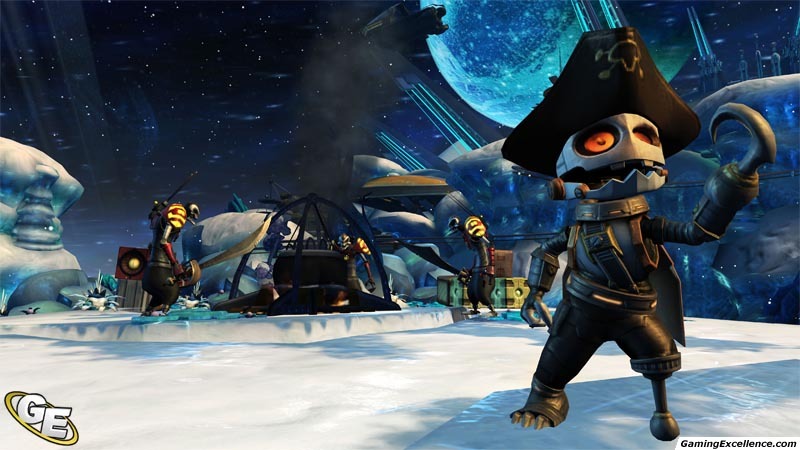 If every game had dancing penguins in it, maybe I wouldn't be such a bitter reviewer. Worst case scenario, you can always whack some enemies with your trusty over-sized wrench. 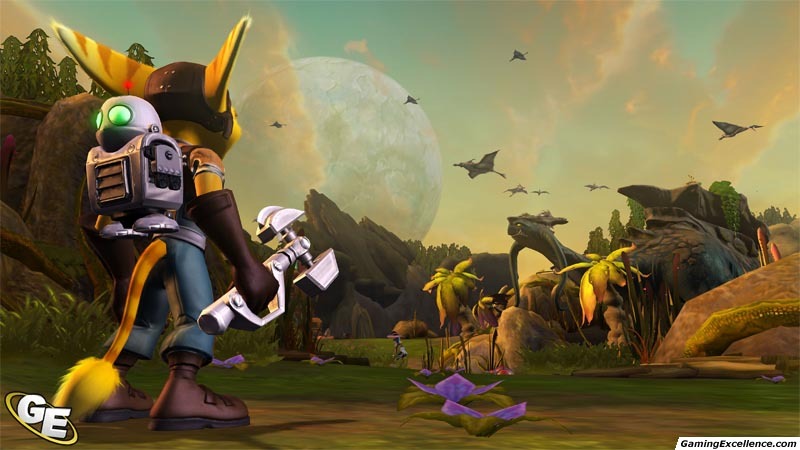 All in all, R&C features one of the most robust selections of weapons I've ever seen. 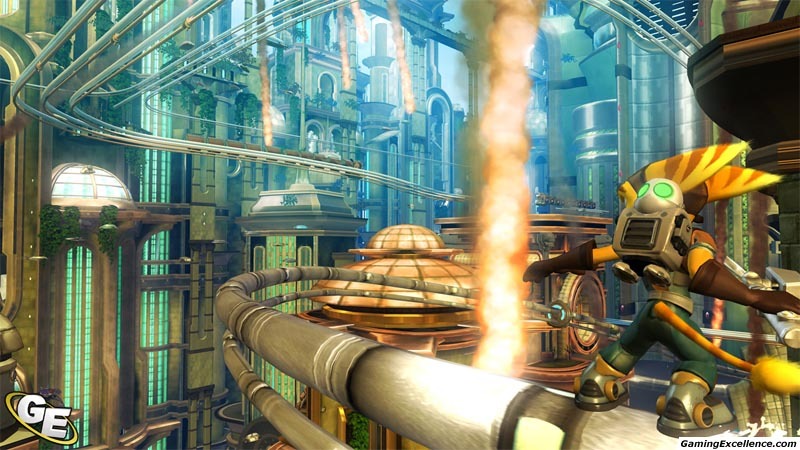 The game also features a lot of platforming sections. Thankfully, the jumping puzzles almost never get annoying. 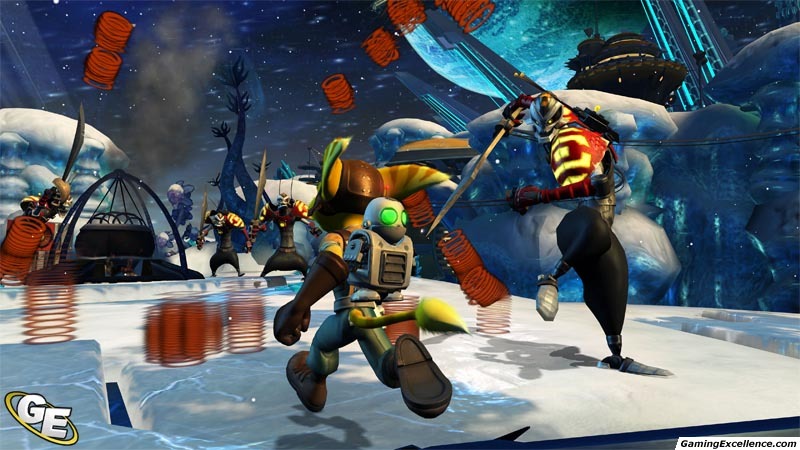 It helps that Clank can help Ratchet levitate across gaps with helicopter blades, and Ratchet mostly controls smoothly. Every now and then, however, the camera will swerve to an awkward angle, or the jump button won't register when you run towards a ledge. Unfortunately, the camera system is far from perfect, and will directly result in a few deaths when it swerves uncontrollably. You can hold the left trigger to lock onto the angle that you're looking at, which helps a bit, but it doesn't let you automatically lock on to enemies. This system makes the game play more like a first person shooter, and still requires some aiming skill. There's also some rudimentary Sixaxis motion controls in the game that I could have done without. 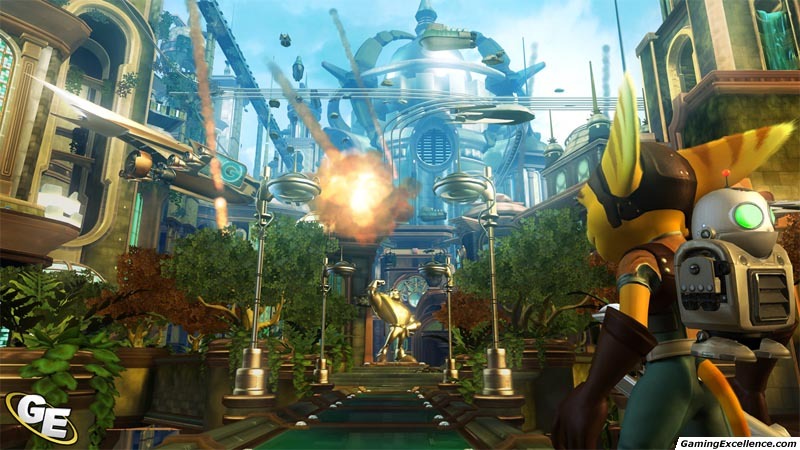 You get a tornado gun that lets you control where the tornado goes by tilting the controller. Trouble arises because it's hard to get the angle for the controller right, and the tornado runs off it whatever direction. You can also steer plummets towards earth, which seem to work significantly better than the tornado gun. Still, I prefer the better precision of the analog stick. Sometimes the game forces you into a few uninspired fetch quests, but just when the game starts to feel a bit monotonous, you'll get thrown into a coliseum battle for your life, or a thrilling chase sequence, and all is forgiven. 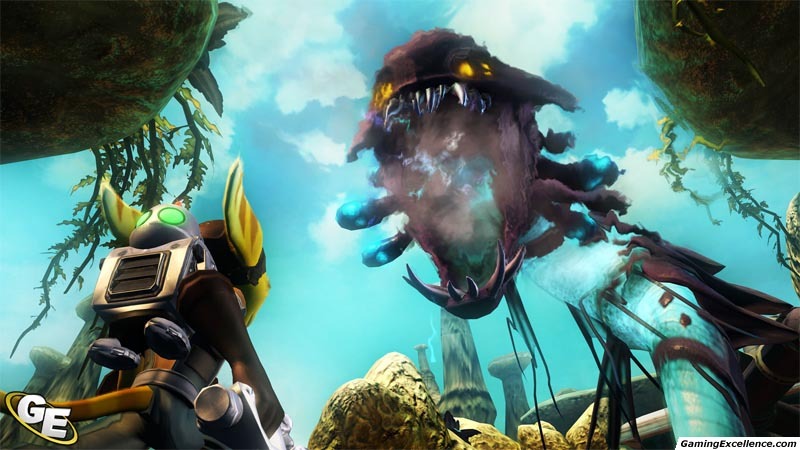 The game breaks up the monotony of constant platforming and shooting in a number of ways. 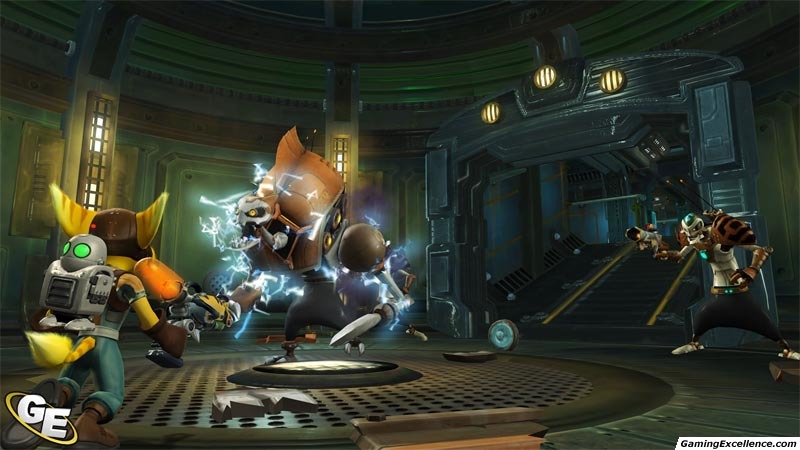 Occasionally, you'll control Clank, who features his own set of moves and skills. 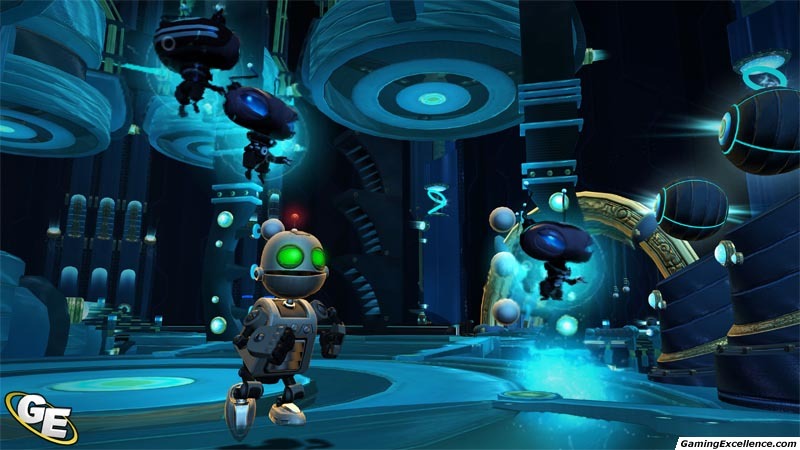 Clank can levitate short distances, control a squad of little aliens called Zonis that only he can see, and slow down time to help solve puzzles. 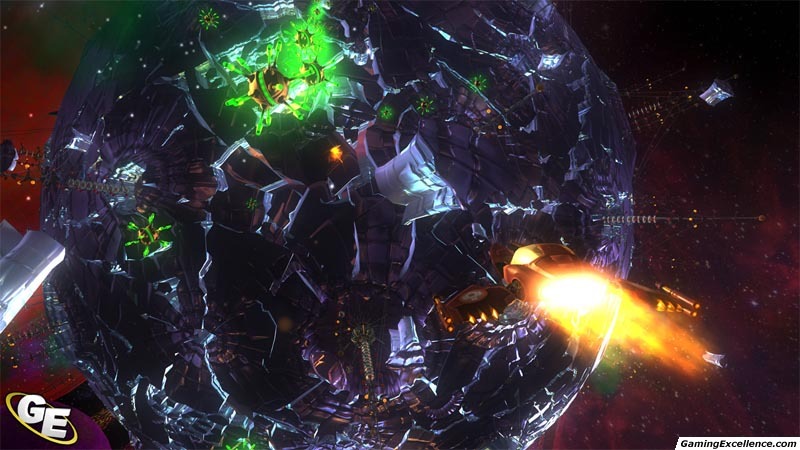 You'll also go through a few StarFox-style space shooter sequences when you travel between planets. During these sections, the left stick controls your ship, and your right stick controls your aiming cursor. These sections are a lot of fun, but don't really present a big challenge. You can keep your cursor on a boss' weak spot while easily avoiding any attacks that come your way. 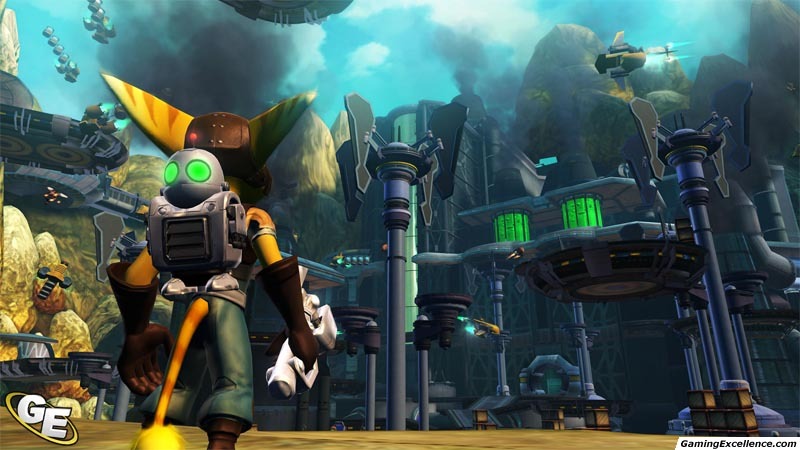 Throughout your quest, you'll upgrade both your weapons and Ratchet's abilities. 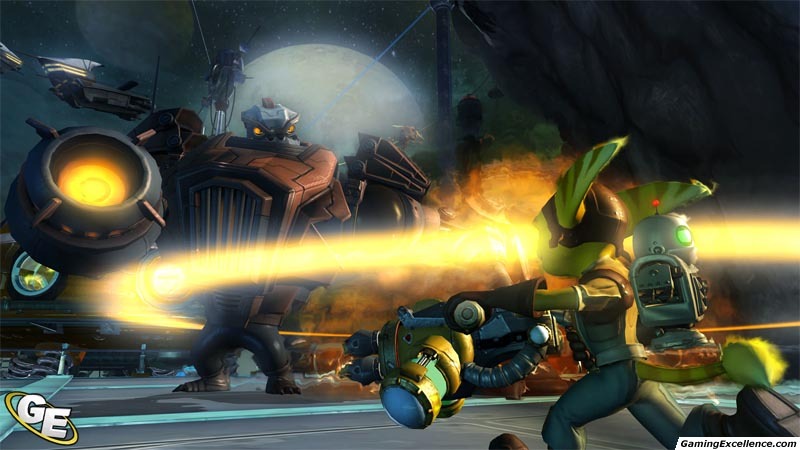 The more enemies you kill, you'll gain bolts, raritarium, and experience which increases your health. Bolts are the currency of the game, and allow you to buy new weapons and ammunition at the plentiful vending machines throughout the game. Raritarium, on the other hand, lets you upgrade various aspects of your weapons such as ammo capacity, damage, firing rate, and other special bonuses. 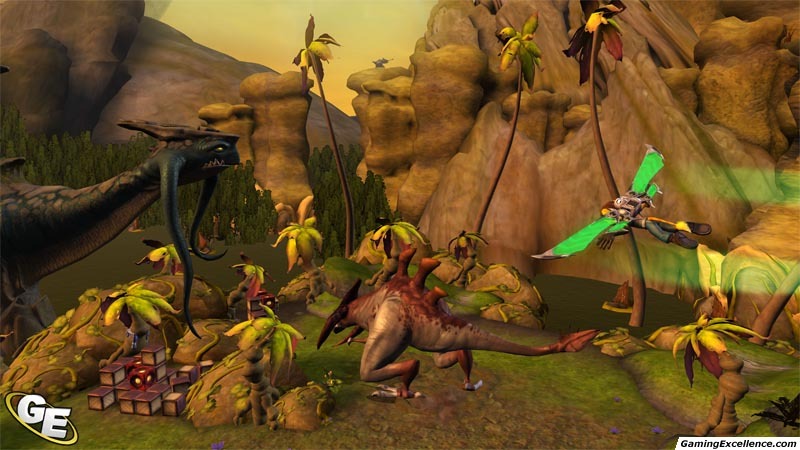 These RPG style elements add a lot of depth to game and give you a real sense of progression. 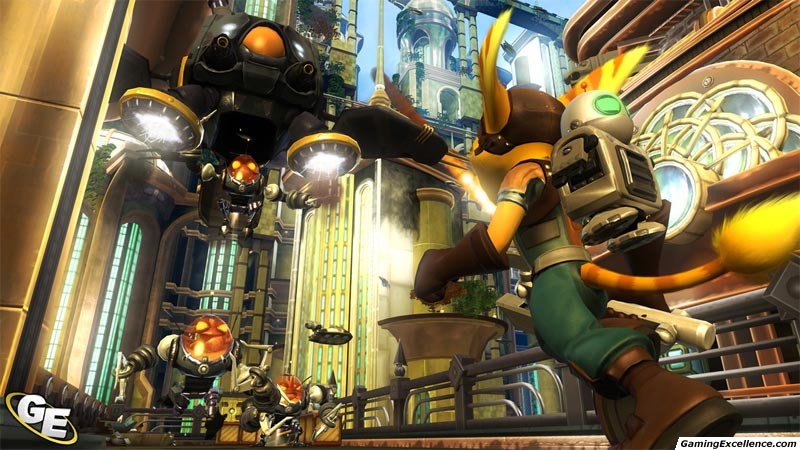 Unfortunately, Insomniac has neglected to include any sort of multiplayer mode for this go-around, which is an odd omission considering how well received the multiplayer modes of past titles were. 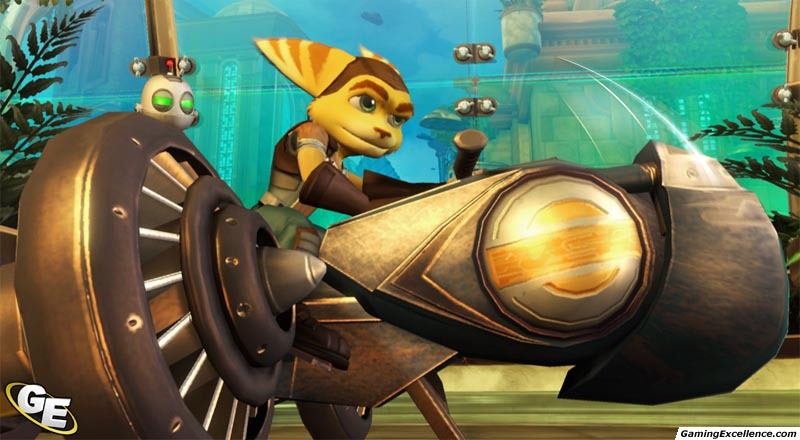 If there's only one thing that R&C has going for it, it's the graphics. Remember back during the pre-launch hype for the PlayStation 2 when an over-zealous Sony executive promised us Toy Story in real time? Well, it may be seven years and a full console generation later, but this game looks as good as a Pixar movie. 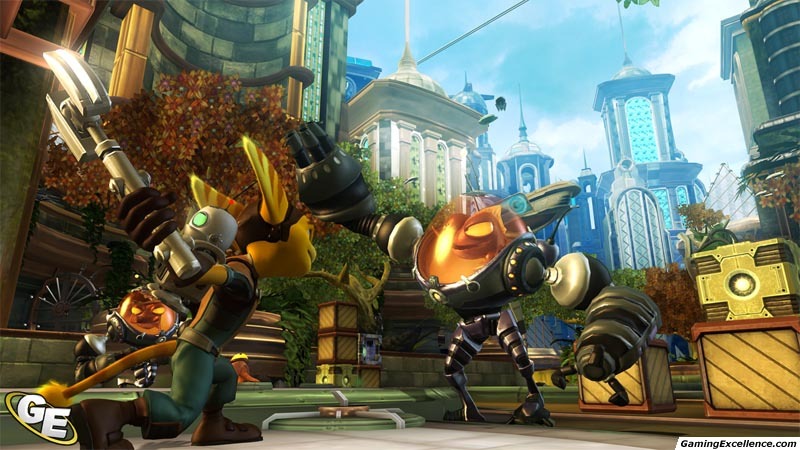 From the subtle animations of Ratchet's ears and tail, to the looming and busy environments, R&C is a feast for the eyes. The game is sharp, colourful, and takes full advantage of that fancy HDTV of yours. 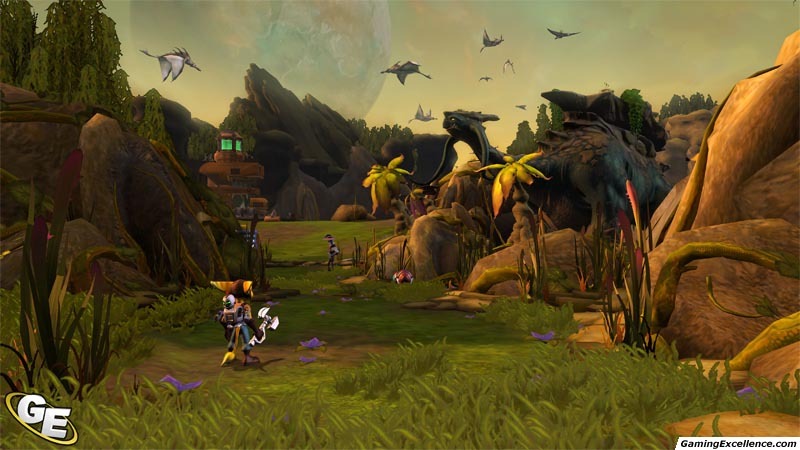 Every level looks very different than the one that game before it and feature some admirable art design. Most importantly, the game always maintains a buttery smooth frame rate despite numerous enemies and explosions always on screen. Yes, there is the odd blurry texture or animation glitch, but they are few and far between. 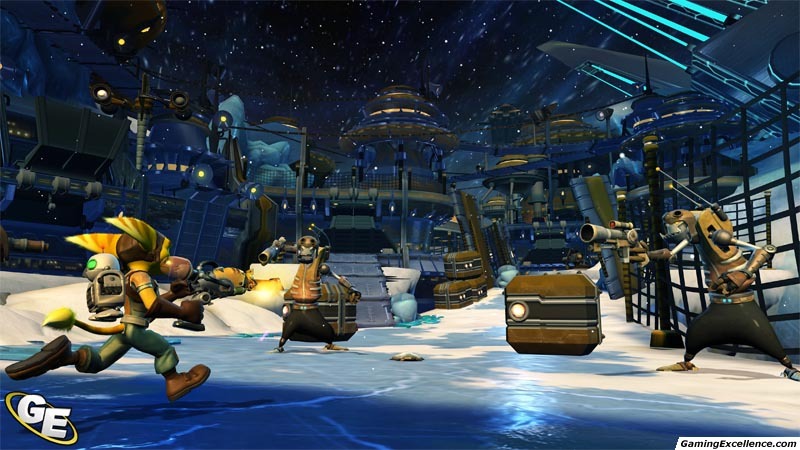 R&C is a graphical powerhouse and one of the most impressive visual titles to date. 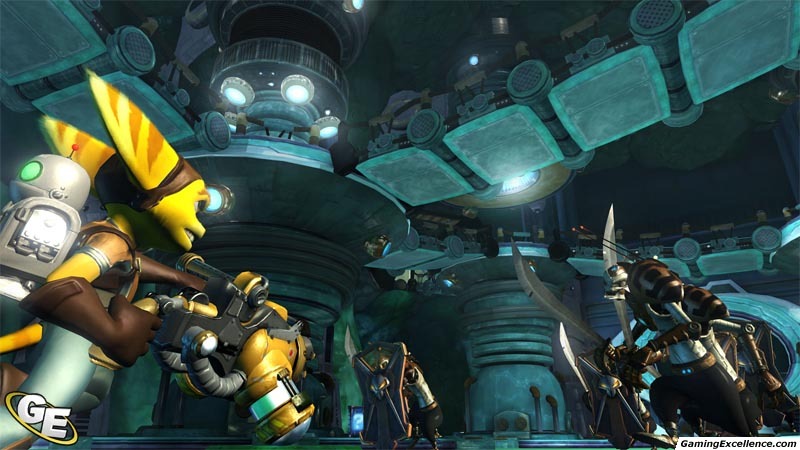 R&C also features some fun and enthusiastic voice acting that is appropriately over the top. 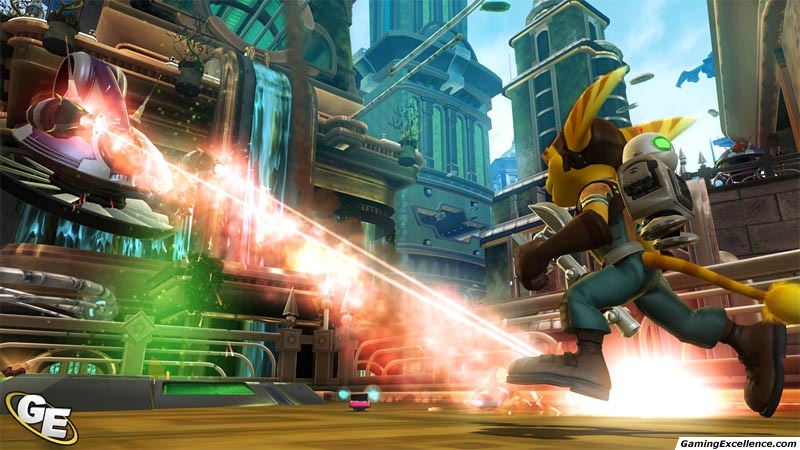 The weapons also feature some solid sound effects that emphasize the punchiness of the weapons. However, the real treat here is the Danny Elfman-esque soundtrack that is equal parts whimsy and bounciness. The soundtrack suits the mood of the game perfectly. It has become increasingly clear during the short lifespan of the PS3 that Insomniac has proved to be an invaluable asset to Sony. While Bungie produced a killer app for Microsoft once every three years, Insomniac now has two (the other being Resistance: Fall of Man) for the PS3 in just a year. 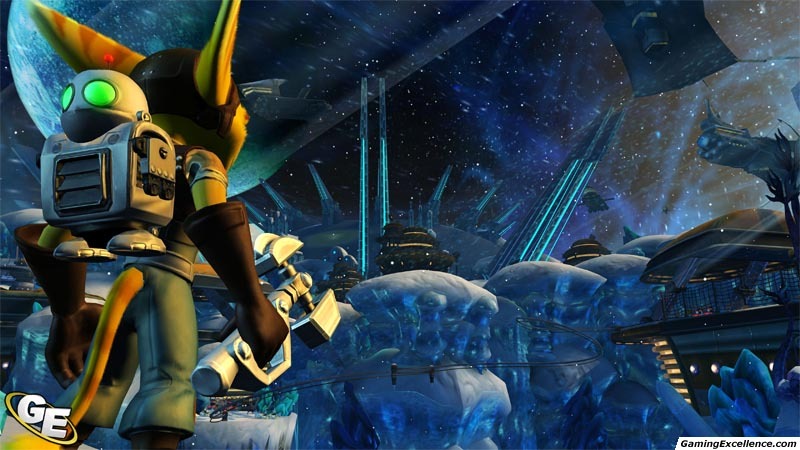 Ratchet and Clank Future is the perfect showcase for the power of the PlayStation 3, and you know what? It's a lot of fun to play too. 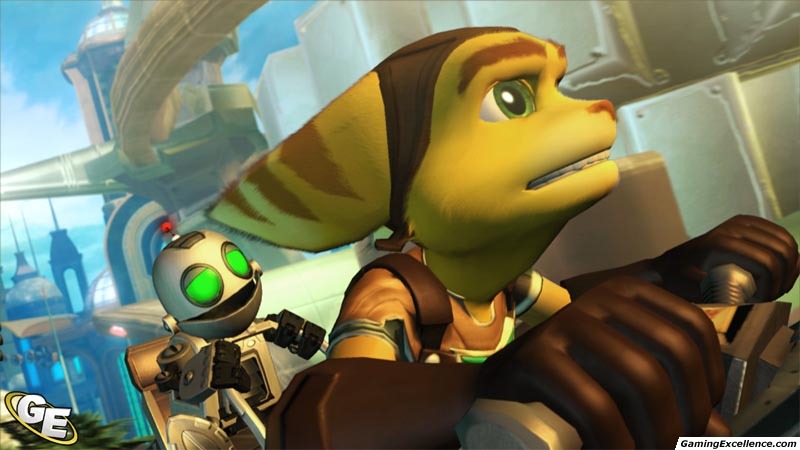 All of a sudden, the PS3 has got game, and Ratchet and Clank are leading the way.